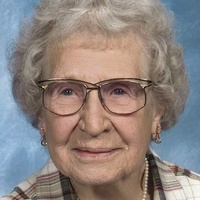 Bea Jarstad (Bessie Marie Hellickson) passed away Sept. 30, 2018, at Hayden Country Guest Home. Bea was born March 28, 1922, in Max, N.D., to Albert and Julia Hellickson. She was one of 13 children. Bea graduated from Minot High School in 1939. Bea lived and worked in various places including Chicago, Ill., Portland, Ore., and the Farragut Naval Base in Idaho before she moved to Scobey, Mont., where she met Everett Jarstad. They were married Jan. 9, 1948. Later that year they moved to Coeur d’Alene, Idaho, where they have lived ever since. They had two children, Barry and Beverly. Bea and Everett enjoyed living in Coeur d’Alene and playing whist and bridge with friends. She was an active member of the Trinity Lutheran Church where she was involved in many activities. She and several friends started the Lefse making program, which they used to raise funds for the church. Bea liked to sew, was an avid gardener and was known for her baking, especially pies. She always had a sample of something for you to try. She was very popular with her neighbors. Bea was the last child surviving of her 12 brothers and sisters. She was preceded in death by her husband, Everett in 2003, and her son, Barry in 2013. She is survived by her daughter, Bev DeSomma of Post Falls, Idaho; daughter-in-law, Diane Jarstad; her grandson, Chris (Katie) Jarstad, all of Coeur d’Alene; and granddaughter, Amanda of Seattle, Wash. She is also survived by numerous nieces and nephews around the country. We would like to thank the staff of Hayden Country Guest Home for taking very good care of our Mom and also the wonderful people of Hospice of North Idaho. A memorial service will be held at 2 p.m. Friday, Oct. 12, 2018, at Trinity Lutheran, 812 N. Fifth St., Coeur d’Alene, ID 83814. Memorial contributions can be sent to Trinity Lutheran Church.